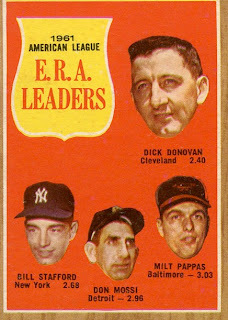 Every now and then, baseball cards return to the floating head, that single design element that's equal parts "spotlight" and "creepy." Topps league leader cards use it off-and-on since their debut in the 1960s. 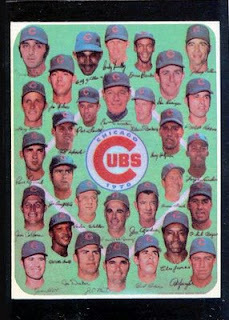 Chicago Cubs team cards went bodiless for most of the 1970s. 1971 Topps #502, no room for a team name! 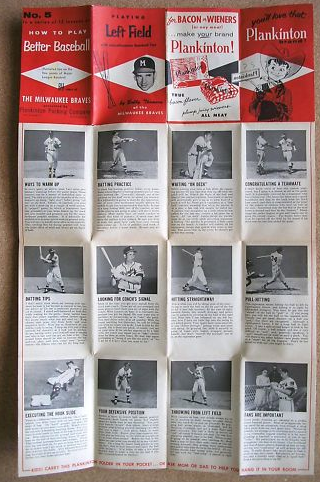 Magazines and newspapers no doubt used close-cropped head shots well before then, but today's #5--actually a folded booklet--predates anything I've seen on regular cards. Bobby broke his ankle during spring training in 1954, so gave way to a rookie outfielder named Hank Aaron, who went on to play 122 games and hit his first 13 MLB homers. 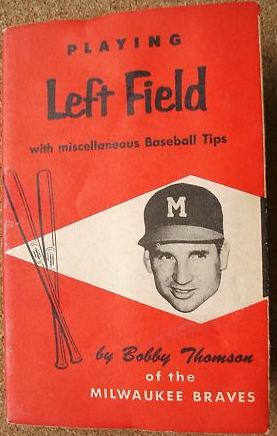 Aaron shifted to right in 1955, returning Thomson to left, a lineup Milwaukee kept through mid-1957. Value: I recently came in second on eBay for a mid-grade booklet at $70, so that's a starting point. As of this writing, another eBay seller lists it for $220 Buy-It-Now, so let's call its price "variable." I don't understand the "creepy" perception that people get with these cards. Whimsical? Yup. Fun? Yup. Goofy? Yup. Creepy? No. I don't think that was ever the intent.